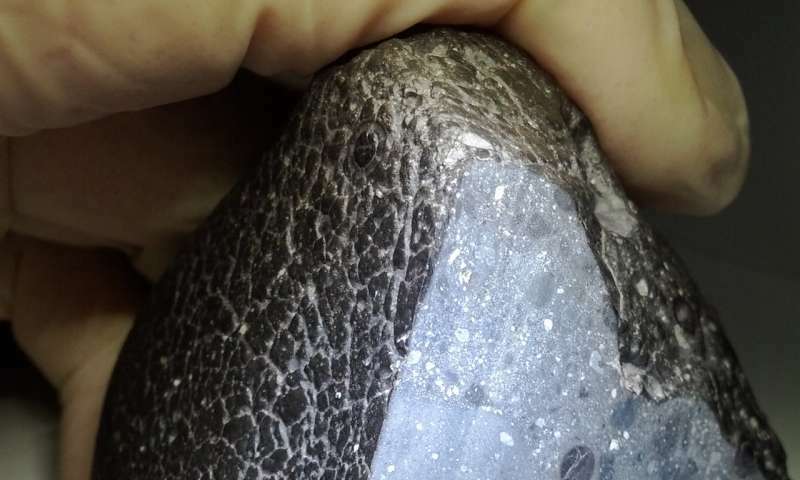 A new study of a rare basaltic meteorites called angrites suggests that volatiles, which are elements with relatively low boiling points such as water, could have been brought to our planet by meteorites during the first two million years of the solar system. "We're looking at as many meteorite parent bodies as possible right now to figure out where they were in the early solar system and how much water they had," says Adam Sarafian, a recent doctoral graduate in the department of Earth, Atmospheric, and Planetary science at Massachusetts Institute of Technology. "We're trying to build a map of the very early inner solar system. Where was the water, where was it going and where did it come from?" Sarafian is the lead author of a paper describing the findings of the angrite study in the journal Geochimica and Cosmochimica Acta. Angrite meteorites formed in the inner solar system extremely early, roughly 4.56 billion years ago. At that point, the Earth was likely still just 20 percent of its current size, while Mars, which formed more quickly, was probably close to its current size. Scientists aren't sure how quickly Mercury and Venus were formed. During this time, the inner solar system was a hot and dry place. Protoplanets and asteroids had molten surfaces and, when in magma, even an element such as carbon, which has a boiling point of 4,800 degrees Celsius (8672 degrees Fahrenheit), is considered to be a volatile. It has therefore been unclear when delicate, low-boiling-point elements such as water came aboard, particularly as the hydrogen required to make water molecules would have been boiled away by the high temperatures. "Was hydrogen basically devoid in these rocks and in the early Inner solar system?" asked Sarafian. Sarafian and his colleagues measured a common mineral in basaltic meteorites, called olivine, for the volatile elements hydrogen, carbon, fluorine and chlorine. Since basalt is formed during the cooling of igneous (molten) rock, converting the volatile element content of olivine easily translates to the composition of the basaltic melt. "Once we know the melt composition, we can then calculate what a planetary body's water content was," Sarafian said. Different sources of water in the solar system are commonly compared to Earth's water by measuring the ratio of the hydrogen isotope deuterium to hydrogen (D to H). While this specific study did not measure that ratio, a study Sarafian published earlier in 2017 in the journal Philosophical Transactions of the Royal Society A showed that the angrite parent body's water matches the Earth's water composition perfectly. This suggests that both the water found in angrites and early Earth's water came from the same source. "It's a fairly simple assumption to say that Earth's water at least started accreting to Earth extremely early, before the planet was even fully formed," says Sarafian. "This means that when the planet cooled enough so that liquid water could be stable at the surface, there was already water here." By the time Earth was fully-formed 4.54 billion years ago, Mars already had a 20 million year head start as a stable mass with water and other volatiles on its surface, such as carbon, fluorine, and chlorine, adds Sarafian. Other research has shown abundant evidence of water on Mars' surface in the ancient past, through features including ancient river beds and minerals formed in water, such as hematite. Sarafian's team also estimated how big the angrite parent body was, using the water and carbon content found in angrites. Water and carbon content is pressure dependent, so by estimating the pressure the researchers could then deduce the size. 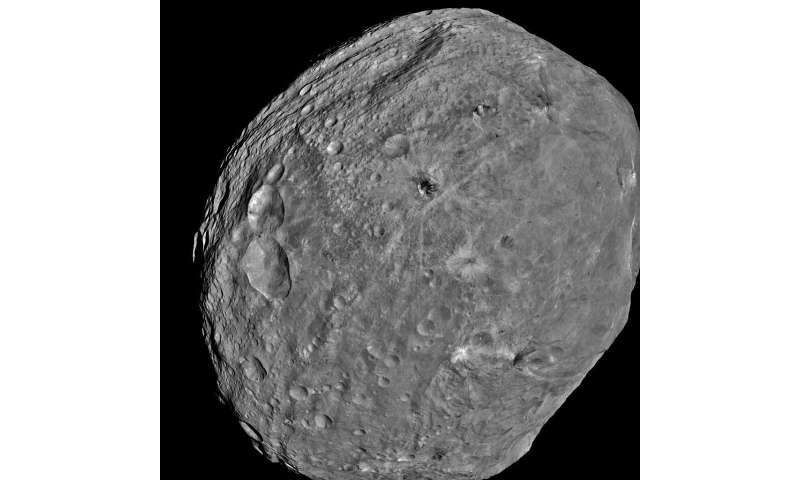 The angrite asteroid was likely about as big as the asteroid Vesta, which is roughly 525 kilometers (326 miles) in diameter. Earth is about 25 times larger in diameter than Vesta. At what point do planetesimals become meteorites? "At what point do planetesimals become meteorites?" When they impact something much, much larger ?? It's a much more mysterious question, from where did these nebulous researchers come to Earth than the question of where water comes from? I have never heard a stupid conclusion from the notion that the asteroid brought water to Earth. Who in such a "specialists" has disturbed the brain to put such balances into the public. Indeed, it must be understood that in the universe there is someone who punishes those unconscious, so they allow them to whip something that no human animal feels like. And where did they get on the planet? It must have been forbidden by some civilization for their stupid ideas and placed them on Earth to spread their "knowledge" WONDERFUL UNDER "
Another "mysterious question", why post unreadable comments? Well if we';re going digging into the past making some "educated" guesses it might be interesting to consider that the bible clearly indicates that earth was formed out of water and surrounded by water after formation. "But they deliberately forget that long ago by God's word the heavens came into being and the earth was formed out of water and by water." In fact to take it even further everything in the known universe was part of the same ball of water. "Let the water under the sky be gathered to one place, and let dry ground appear." And it was so." There are some really interesting implications resulting from this: The magnetic fields of earth and other planets and indeed even galaxies themselves can be predicted when postulating that the magnetic moments of all water molecules were aligned before the water was trans-mutated into whatever elements were required to form the earth. Just a two pence, since this whole article is using rank speculation. I do not know good English, but for this view of the appearance of water on Earth, you really should have a level of awareness of zero. It is necessary to know how and when chemical elements are formed after the supernova explosion. But science does not recognize the most important thing in the universe, that there is a Spiritual Entity of the Universe (SEU), which is the immense power of forming everything obscure in the material-energy entity of the universe (MEEU). Wow! It's gonna be difficult to choose between milnik and FredJose as the most incoherent babbler in these comments. The Spiritual Entity (SEU) is an indefinable and unknown time of existence, but everything in the material energy entity of the universe has formed itself, and even you who ignore it and mourn its existence. It is not a religion because it is older than all religions. And those who ignore the SEU, you are not members of the human part of the civilization, because you do not have enough consciousness or intuition that can connect you to the SEU. SHOW! This is not a religion, this is an eternal truth, and soon it will become a superficial knowledge of science, which wanders in ruins of desolation, where SEU runs away from such enthusiasts.